Dialysis Management System is designed to accommodate the needs of dialysis centre to keep track their patient records as practiced by the GP clinics. With specific dialysis operation requirements,Dialysis Management System promotes effective dialysis centre management and alleviate the business productivity. 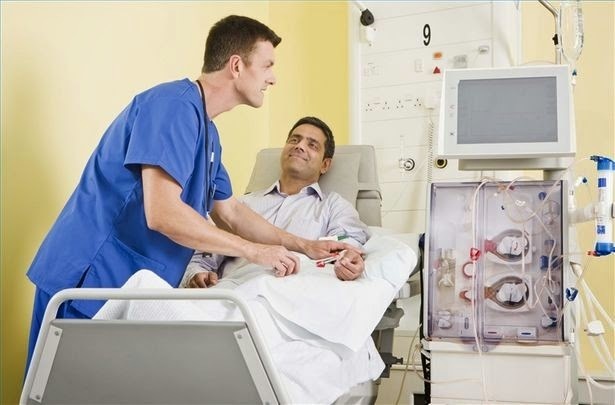 Important aspects of hemodialysis operations such as Pre-HD, HD and doctor’s consultation are included while centres can also enjoy the other important administrative features such as stock inventory and purchasing, treatment package, monthly panel claim and dialysis machine maintenance activity. With the use of Integrated Management System, centres can also upload their collection and patient records to the HQ office with few mouse clicks at the end of the day. Comprehensive reports and various panel claim report format are also included. 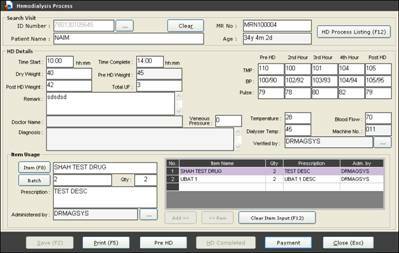 Ease user to records Patient Details including Panel Details, Reference Number, Next of Kin, Treatment Information etc. Clinical module cover Patient Treatment details, Laboratory Test record, and Medical Consultation. Module that ease paperwork for panel billing, invoicing, tracking and monitoring panel payment history. Also help to calculate patient treatment for confirmation. Module for user to monitor inventory level and keeping track with item movement including controlled drugs and hazardous item. Provide administrative function such as generating Routine Reports, Inventory report, Payment report, Staff Attendance Report and Collection details.